If you plot the various earthly species on a vertical line and position them according to how far and fast they can travel under their own power for a given unit of energy, guess who is at the top? The condor. Man, on the other hand, isn’t even close. But give that man a bicycle and he shoots out far ahead of even the condor on that graph. The bicycle allows a man to travel extraordinarily farther and faster. Consider RSS to be the bicycle for your blog. By leveraging RSS, you and your blog can accomplish much more than you can without it. Most blog hosting software (such as TypePad, Moveable Type, WordPress, Blogger, etc) can publish your blog in two formats. The first format is designed to be read using your web browser. This is the format you are most familiar with. The second format is RSS, which stands for Really Simple Syndication. RSS strips out all the graphics and formatting, leaving just the content. This format is also sometimes called a feed. 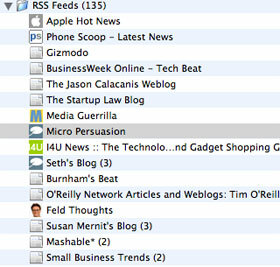 RSS is designed to be read using a new breed of program called a Feed Reader or RSS Reader. Why would you want to read a blog using an RSS Reader instead of your web browser? Simple: An RSS Reader aggregates the feeds from multiple blogs onto a single, easy-to-scan page. Not only that, it plainly marks the blogs containing new posts. Here you can see a snapshot from Safari. The little ‘(3)’ next to Seth’s Blog tells me that Seth’s Blog contains three new posts that I have not read. Burnham’s Beat, just below it, contains no new posts. Bookmarking feeds in this way is called subscribing to feeds. At last count I track over a hundred blogs every day. If I had to visit each blog in turn using my web browser this would be an impossible task. Using the feed reader built into Apple's Safari web browser, it takes only a few minutes. This capability is not restricted to Macs. Microsoft Internet Explorer 7 also has a built-in feed reader. NewsGator offers very inexpensive stand-alone feed readers for Windows, Mac, and Windows Mobile. There are also several free online web-based feed readers. Now we’re getting to the bicycle part. Blogging is a conversation. For your blog to be part of that conversation you must read other blogs in your market or industry, comment on the posts you find there, and create posts of your own on the same topic (and don’t forget to create a trackback when you do!). As a result, you will create personal relationships with other experts in your industry, become more plugged in to industry changes and events, and greatly expand your visibility and exposure. 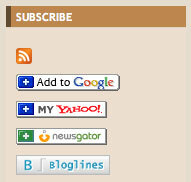 Don’t limit your RSS subscriptions to just blogs. For example, did you know that Google allows you to create an RSS feed of search results from Google News? The combination of your RSS subscriptions and an RSS reader provide you with a giant drift net stretched across the Internet, keeping you abreast of industry trends as well as providing you with an endless supply of topics to blog about. Not only that, you want to make it very easy for your readers to subscribe to your feed. Safari and MSIE 7 make it easy to subscribe to a feed. Users of online web-based feed readers (like Google Reader) are not quite so lucky, but you have the power to make it just as easy for them too. You can use free services like FeedBurner to add Feed Subscription Buttons - like those shown to the right - to your blog’s sidebar. Anyone using Google Reader can simply click on the Add to Google button to subscribe to your feed, for example. RSS is a bicycle for you because it enables you to track an enormous number of blogs and absorb vast amounts of information – far more than you could accomplish without it. And RSS is a bicycle for your blog too because it enables you to turn casual readers of your blog into regular readers, and regular readers are more likely to link to you and propagate your message.